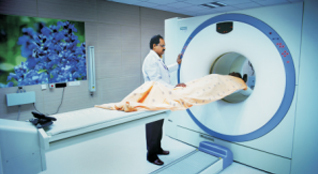 The Siemens Biograph – 6, state of the art, whole body PET scanner with a diagnostic 6 slice CT scanner at the Department of Nuclear Medicine enables whole body staging of cancer in a single step. This revolutionary modality images the metabolic status of the cancer cells through a PET and structural changes with a contrast enhanced CT scan thus making it a one stop imaging platform. Thus the need for multiple regional scans is eliminated, saving patient’s time. A whole body PET-CT is currently the gold standard for initial staging, post treatment assessment and evaluation of recurrence in cancer. The Symbia T from Siemens, a dual headed variable angle gamma camera with a diagnostic CT obtains images of the highest quality and resolution currently available in the world. 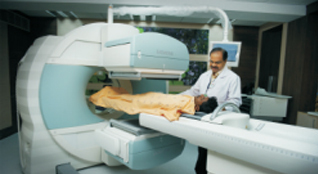 Reduced radiation exposure to the patient and faster scanning time are some of the features of this Gamma camera equipped with cutting edge technology. SPECT-CT of the skeletal system, cardiac perfusion imaging, cancer thyroid evaluation, neuro psychiatric functional & molecular imaging, renal function & GFR assessment etc are done with high end precision and negligible inter observer variation, thus redefining the standard in functional imaging. The department is equipped with one of the largest isolation therapy wards in South India and has facilities to treat cancer of the thyroid, metastatic neuro endocrine tumours, hepato cellular cancers & widespread bone metastasis. OP based therapies for thyrotoxicosis, bone pain palliative therapy, radio immune therapy and synovectomy are also available. High dose / Isolation and Radionuclide therapy facility at KMCH ! Having the capacity to treat up to 20 thyroid cancer or thyrotoxic cases per week, your patients do not have to wait for an appointment. The scan and treatment can be administered in the same sitting on the same day, thus eliminating the need to stop Eltoxin/Thyonorm on two separate occasions for scanning and treatment and waiting for months to get treated ! 1131 treatment for AFTN,toxic MNG,non toxic goiter etc.